Order The Licensable BearTM Big Book of Officially Licensed Fun! All four issues, plus additional stories - $14 postpaid! Hey there, welcome to my website! I’m the one and only Licensable BearTM, the little bear who just wants to be licensed for products. I want to be on t-shirts and tuxedos, breakfast cereals and celebratory sparkling cider beverages! Oh, and a TV show! I’d love to have a TV show with all the ancillary tie-ins. 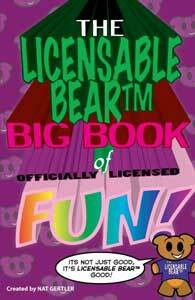 Order The Licensable BearTM Big Book of Officially Licensed Fun! All four issues, plus additional stories – $14 postpaid! If you’re here, you probably found the web address on one of my comic books, but if you didn’t, you should read some of my comics. Click on COMICS to read a sample, and be sure to check out the fine Licensable BearTM PRODUCTS that are already available! Licensable BearTM is trademarked and copyright 2003 by Nat Gertler. All rights reserved. Website content copyright 2003-2005 Nat Gertler.